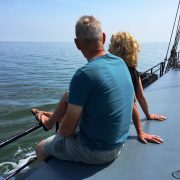 It is possible to sail with the Sleepers to and from Vlieland or Terschelling. If you would like to sail along on a traditional ship, grab your chance now. Whether or not you have booked a cabin with Sleepers, simply choose the ship with the sailing time that suits you best. In general, there is no sailing during the crossings but on the motor hazards. The costs for a single journey are € 25, - pp (children up to the age of 10 can travel for free, but please state this when booking). A crossing takes about 3,5 hours. The duration of the trip depends in part on the weather and tides. There is no catering on board, so make sure you have something to eat and drink. You can also sail if you have not booked an overnight stay on a sleeping ship. If you have booked a crossing, the latest travel information will follow a week before departure by mail.